Transforming Hollie: How We Did It... Book Giveaway #2! The next book up for grabs is How We Did It... Weight Loss Choices That Will Work for YOU! by Nancy B. Kennedy. I thought this book would be a great read for the new year! I love hearing success stories, and this book is full of them! 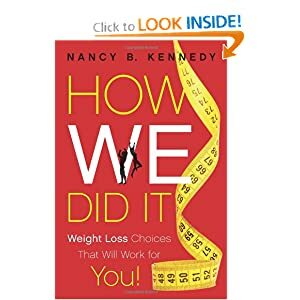 From Amazon.com, "In How We Did It, Nancy B. Kennedy tells the stories of those who have succeeded at their goal of weight loss, whether that means 20 pounds or 200 pounds. These stories will inspire, inform and encourage readers to find the weight loss plan that will work for them. Weight loss plans are too often presented as one-size-fits-all propositions. How We Did It compares the wide gamut of weight loss programs--South Beach, the Zone, Atkins, Thin Within, First Place, Weight Watchers and many more--and shows how weight loss seekers have succeeded using popular plans or by creating their own recipe for success. This book is a resource for both inspiration and information. With chapters that cover everything from childhood obesity to bariatric surgery, the book will help millions of adults who are struggling with their weight. In inspiring profiles, readers meet others just like them who may have tried and failed to lose weight, but who finally found a way to success that suited their lifestyle, personality, spirituality and internal values." If you want this book, please leave a comment on THIS post. You have until THURSDAY, January 3 at 11:59 p.m. CST, and after that I will pick a comment using Random.org. Thank you for continuing to motivate and inspire me to never give up with weight loss. Been interested in this book. Would be wonderful to win! This looks like a really good book. I love getting tips from others. Ready to make that number go down. Would love to read this one too!! Thanks for inspiring us! I'm always looking for new book reccomendations. That looks like a great one to start out the new year with! I hope whoever won this copy of my book finds it helpful! Thank you, Hollie, for offering it. I love success stories, too. It's why I wrote the book. Enjoy!